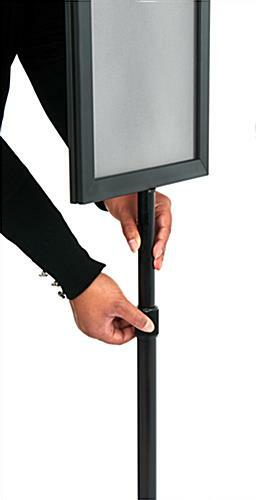 Telescoping pole sets your advertisement at just the right height! 11" x 17" portrait-orientation frame fits standard commercial poster sizes! Slide-in design makes changing graphics quick and easy! 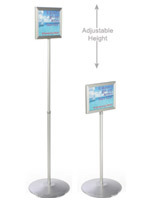 These sign displays are perfect for displaying advertisements in a retail store. The sign displays, also known as poster frames, hold standard, 11" x 17" graphics, printable right off most business printers. The sign displays have a sturdy, 1/4" thick black expanded PVC backer, so regular weight printer paper can be used; thicker poster material is not needed. Another option is to bring the backer to your local sign shop to have it silk-screened with a custom message. 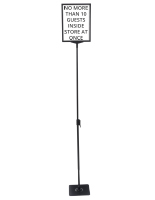 The sign displays feature a 1" diameter telescoping pole so your signs can stand anywhere between 45-1/2" and 69" high. Between the economical cost and versatility offered, these sign displays are a perfect choice for businesses looking to cut costs, stay within a budget, or order a large quantity of units. 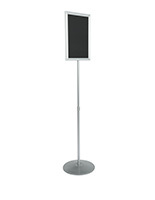 Poster displays, sign frames can be used in virtually any commercial environment. If you need to communicate something to your customers or patrons, a simple sign display is one of the most cost-effective means of doing so. Retail stores, restaurants, museums, hotels and theaters are all common places to see sign displays, such as these. If time is a concern, these sign displays are perfect. 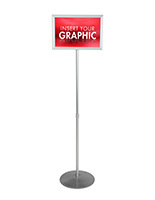 The sign displays feature a simple, slide-in design, so a graphic or message can be changed out in seconds. 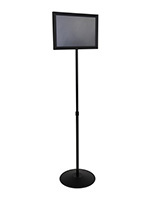 The sign displays are also double-sided and feature non-glare lenses so your poster is visible from all angles! 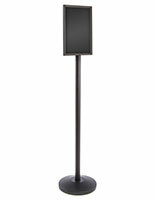 These black aluminum sign displays are shipped unassembled. 1-person assembly takes just a few minutes. Just used this at a networking event and it worked great. The 11 x 17 portrait size because the booth spaces were very close together. The telescoping height was set to maximum which put the double sided sign at eye level. We're so happy to hear your product worked out so well, Steve! Thanks for taking the time to review! Great design that does the job! I was very pleased with the quality and sturdiness of these sign holders. We just added a new addition to our building and bought several to use throughout the building. Very easy to change out signs. We keep our signage for the week right in the stand and just pull out the one we want to display. 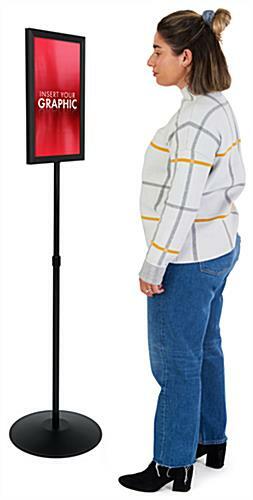 I ordered these to be used as directional signs for a work event. The order was delivered very quickly and the items were correct. There are some scratches on the face of the plastic that would cover the inserted signs but it shouldn't affect the outcome. Good product, great price and I would recommend others get these as well. 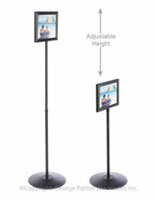 Excellent double sided adjustable floor stand. 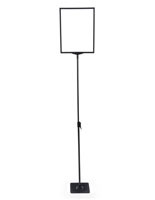 We are a church and have purchased three of these adjustable floor stands for various areas around the building and we have found them to be very helpful for those entering the building. The stands are well built and are easily assembled. We appreciate you taking the time to write the review, Thomas. Thank you! I ordered three of these on a Thursday and they arrived the next Tuesday. Boxed well and easy to put together. Just what we needed to guide visitors around our church...which can be a confusing place as we have added on as we've grown. I read one review complaining about the plastic coverings being scratched. What I realized is that there is a very thin protective peel-off protector layer on the plastic sheets that could be what that reviewer thought was a scratch. It's very thin, like what you put over your cell phone to protect it, but peels off neatly and the plastic is smooth as glass. These are well made--the aluminum frame is smoothly finished at the edges and corners. We'll order more when we need them. Buying them from Displays2Go saved about $30 on each, which worked out to be less expensive even with Amazon's free shipping. We have to be good stewards of our congregation's donations.